Can you do home repairs yourself without a man's help? Sure you can! All it takes for the majority of jobs around the house is some simple tools and a little know-how. Imagine how you will feel when you fix that squeaky door that your significant other never got around to looking at. Even better, you can fix that dripping faucet that drives you crazy and keeps you up at night. Being able to handle basic home care and home maintenance is an important part of living independently. Once you get the basics down, you won't have to call someone (your brother, neighbor, or repairman) every time there's a problem. While you may not be able to fix everything around the house, you can tackle the majority of jobs. Hammer - A 16 oz. claw hammer will take care of most of your jobs, but you may be more comfortable with a lighter 8 oz. hammer. Just be sure that it has a claw end for pulling nails. Screwdrivers - Get an assortment of Phillip's and regular-head screwdrivers. There's a neat little 4-way screw driver that you can find at most hardware stores that has 2 sizes of both Phillip's and regular heads in one handle (I use my 4-way for most of my jobs). Measuring Tape - I would suggest getting a 25 or 50 foot retractable metal measuring tape. Saw - A handsaw is the cheapest to get, but you might consider a circular saw if you will be doing bigger projects and are comfortable using power tools. Pliers - At the minimum, you want a standard pair of slip-joint pliers. If you can afford it, consider getting a pair of wire-pliers and some channel-lock pliers. Crescent wrench - These come in handy when removing nuts and bolts if you don't have a set of wrenches. Utility knife - These are great for trimming jobs. Be sure to get one with a retractable blade so that it can be safely stored and used. You may need to buy more tools as you tackle the various home repairs. Don't worry about it though, because most of these tools can be used for other jobs. An affordable way to acquire additional tools is to wait until Christmas or Father's Day. Most stores have really good sales on tools during these holidays. Since there are so many different things that can go wrong in a home, I am providing some good resources that offer information on how to do home repairs yourself. 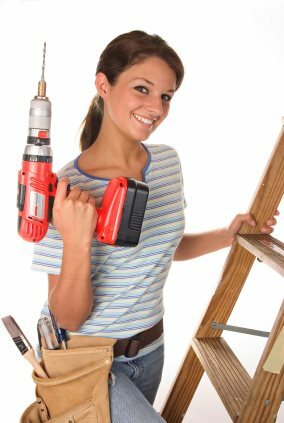 Dare to Repair, Replace & Renovate - This is the Do-it-Herself guide written specifically for women to help them fix almost everything around the house. WonderHowTo - Do It Yourself home improvements aren't difficult with HandymanTeacher Hub Kirkpatrick featuring Do It yourself projects and videos. Repair Home - A home improvement site with lots of great ideas and solutions, plus the ability to find contractors if you don't want to do it yourself. HomeTips.com - Offers everything from DIY to home problem solving. Has an extensive list of repair project with clear instructions.